Are swim-with programs worth it? For many people who are fascinated with animals such as the dolphin, most will pay to participate in "swim-with" programs. Swim-with programs are usually found in most marine parks, however many independent companies with permits often offer swim-with programs as well. They offer the participant the chance to be nose to nose with a dolphin or others such as seals, whale sharks and manatees. However, these programs aren't cheap. In fact, most cost a pretty penny for what it is worth. Below is a few examples and the differences between each program. For the sake of this story, we are only focusing on a few in one state. 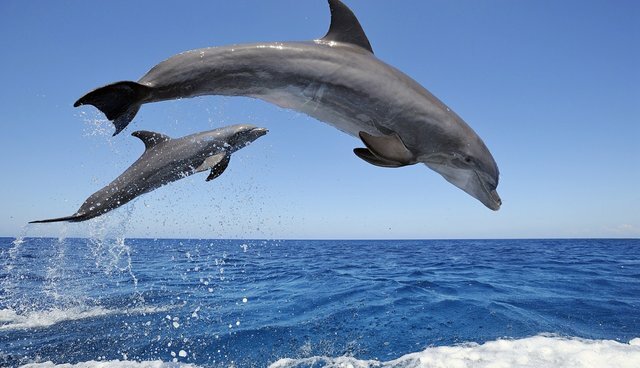 At the Miami Seaquarium, you can embark on a Dolphin Odyssey, a program that allows the participant to shake hands with their dolphin, receive a kiss and go on a dorsal tow. During the dorsal tow, the participant grabs on to the dolphin's dorsal fin and gets dragged a short distance across the pool. The base price for a participant can range from $210-$225. This includes admission to the park, which for a non-Florida resident will cost around $41 (Florida residents cost $30). The tourist is pretty much paying around $160-$180 to embark on this journey. Now, to observe the activity, it will cost the person around $53 for 10 and over, $45 for 3-9. This is just to watch the action. They aren't even swimming with the dolphins. Just young kids watching their parents or other relatives participate or adults watch children. The Odyssey itself is 30 minutes. Guests are usually put into groups of 5 or more. Different parties will be mixed together for groups of less than 5. The experience is actually 30 minutes a group, not per person. The guest themselves will spend only about 5-10 minutes a person with the dolphin. The experience itself is straight forward. Guests are introduced to their dolphin, each guest gets a handshake, a kiss, and a dorsal tow. They also get a short pep talk about safety in the beginning of the program. Each guest has the same experience. The Dolphin Encounter is the same as the Odyssey, however the guest doesn't swim with the dolphins. They only get a kiss and a handshake and get to see them jump. The price for that for the average paying tourist is around $150-$165, with admission being included. This is more geared toward kids or anyone under 52 inches (you must be taller than 52 inches to swim with dolphins). For a child 5-9 years old, it is around $110-$125. To observe is $53, for a kid, $45. Guests can also swim with seals as well. However, there is a short free swim with the seal. Before doing so, participants take part in a training session and gets a hug and kiss from the animal. The program last 20 minutes.... a group. Per person it ranges from 5-10 minutes as small groups might be combined. All guest experience the same events. The price for this program is around $150-$160, $110-$125 for a kid 5-9 years old. To just watch the family engage in the fun is $43, for kids $35. Like the rest of the programs offered, admission is also included. Perhaps, the most popular go to place to swim with dolphins is at Discovery Cove. An all inclusive tropical paradise where guests can swim with dolphins and snorkel with stingrays and colorful fish. Most guests from around the world flock to the resort to swim with dolphins. The average price per person without the dolphin swim is around $150-$200. Tickets with dolphin swims are around $250-$350, this also applies to children over the age of 2. The pricing is similar to airline pricing, the higher the demand, the higher the price. The guests doing the dolphin swim are given a time and a cabana to meet at. There are three cabanas for the dolphin interaction and three corresponding pools. Per pool, there can be two or even three groups of people, 6 people an interaction. They see a short video on safety and about dolphins and then go to the interaction. Each group of guests are introduced to a dolphin and each guest one at a time get to kiss and hug the dolphin. Interactions are 30 minutes for the group, 5-10 minutes for the guest themselves. Once each person has had their dorsal tow, they are lead to the photo cabana to buy pictures. The problem with most swim with programs is that for a easy way to interact with a dolphin, the price is very high for the quality. Interactions are 30 minutes a group, for a person it can range from 5-10 minutes. For a 5-10 minute interaction each for a family of four, it can range from $850-$1,200 depending on the place. Each guest has the same experience, no encounter is really personal or educational. It is personal for the guest, but most guests find that interactions are rushed and very short for the price being paid. To swim with dolphins in the wild, however is a different story. Dolphin Paradise Tours is a company where guests are taken to a remote island where they can explore the beach and watch the birds. Guests can also swim in the water teaming with dolphins and manatees. The tour is two hours long, and guests aren't allowed to approach the animals to preserve their natural habitat. The animals get naturally curious to swim to them. All while the naturalists educate about these animals. The price for the tour is $40 a person. Most swim with programs in the wild are around $20-$50 a person depending on the company. The difference is that for the price, the guests are getting more. They have an interaction that not only preserves the animals' natural habitat and respects the animals, but they have an interaction that is more personal and awe-inspiring. The dolphins do not have to interact with guests, but their curiosity gets the better of them. They have a choice to swim away or look. Seeing animals in their natural habitat educates the guests more as well. In short, paying $250 for a shared interaction around 5 minutes a person is like paying $20 for a big mac. The price doesn't match what the guest believe he or she is getting.